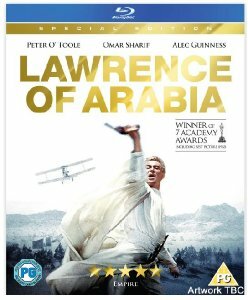 It seems fans of classic films are really being well served this year, the latest news being that Sony Pictures Home Entertainment﻿ are releasing Lawrence of Arabia on Blu-ray﻿﻿ this 10th﻿ September. With a runtime of 227 minutes and a recommended retail price of £15.99﻿, this includes a newly re-mastered 5.1 Dolby Digital soundtrack. Extras will include overture, intermission, entrance and exit music, a picture-in-graphics track, which allows the viewer to become immersed in the world of Lawrence of Arabia and learn about the customs and rituals of desert existence, Peter O’Toole Revisits Lawrence of Arabia featurette, The Making of Lawrence of Arabia featurette﻿, A Conversation with Steven Spielberg featurette﻿, The Camels Are Cast featurette﻿, In Search of Lawrence featurette﻿, Romance of Arabia featurette﻿, premiere newsreel footage and advertising material. Winner of seven Academy Awards, including Best Picture of 1962, Lawrence of Arabia stands as one of the most timeless and essential motion picture masterpieces. The greatest achievement of its legendary, Oscar-winning director David Lean, the film stars Peter O’Toole in his career-making performance as T.E. Lawrence, the audacious World War I British army officer who heroically united rival Arab desert tribes and led them to war against the mighty Turkish Empire.